Ever since watching Gone with the Wind as a child, Carolyne Roehm has long had a predilection for the South. As she matured, her interests turned more to European history, particularly that of France, where she spent many years on and off. But after a fruitless search for a house in the country there, her thoughts turned back here to the States. 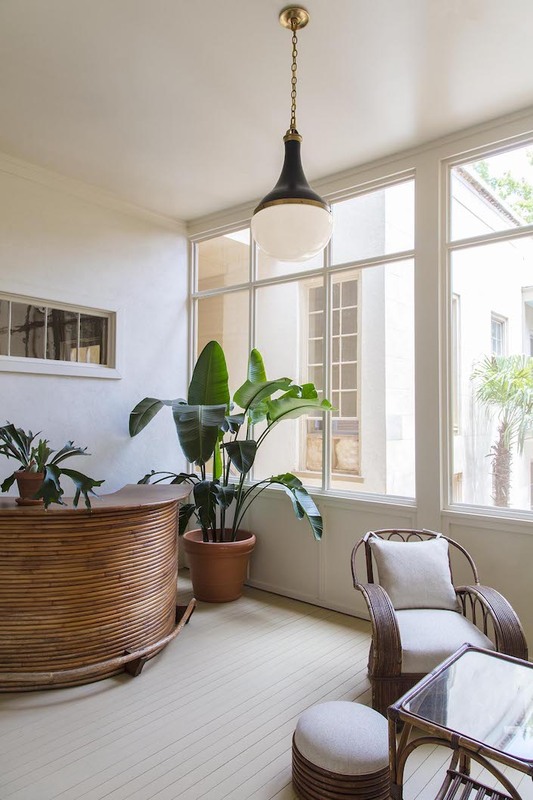 And after several trips visiting friends in Charleston, she found and fell in love with Chisholm House, a historic 19th century Greek revival house. Please join me and Susanna for a behind the scenes visit with the multi-talented and ever evolving Carolyne Roehm in Charleston. Like everything she undertakes, Carolyne approached her restoration and renovation of Chisholm House with creativity, self-education and resolve. Informed by her enthusiasm for classic architecture and design, her decor is also inspired by her travels and great love of nature. 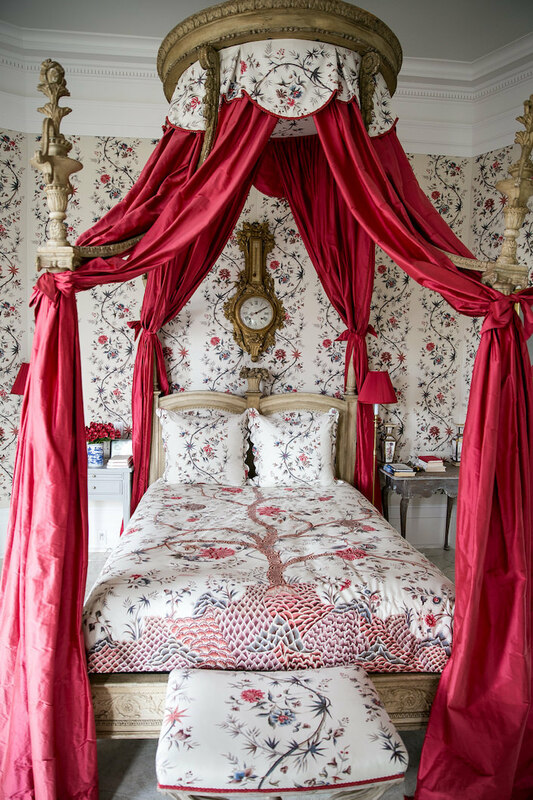 Throughout the house, Carolyne has incorporated special finds and worked with expert craftsmen to create bespoke furnishings reflecting her taste and creativity. Above, an 18th c. bed surrounded by a favorite Braquenié fabric. 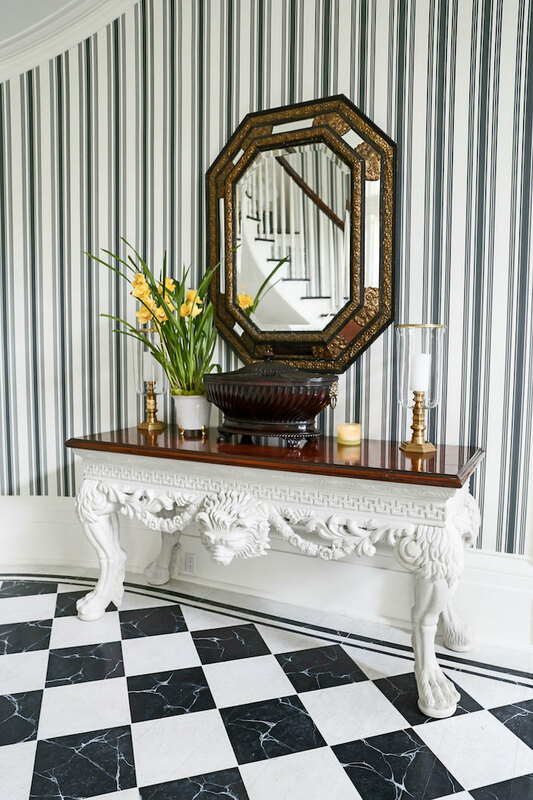 And while many of the furnishings are serious collectibles, Carolyne is not above mixing in budget finds with her beloved antiques, expressing a joie de vivre and often a sly sense of humor. 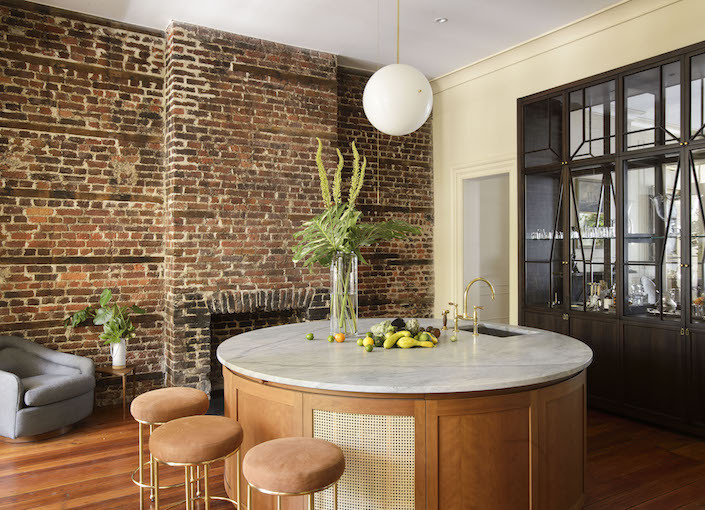 So thank you Carolyne, we are thrilled to be able to share your very special Charleston home. A big thank you also to video sponsor Farrow & Ball, the historically based British paint and wallpaper firm, whose Tented Stripe paper graces Carolyne’s majestic entry hall, above, and whose Calke Green paint is the basis for her exotic chinoiserie room, below. This entry posted in architecture, art, At Home with, furniture, interior design, Quintessence video series, Stylish Shopping, travel. 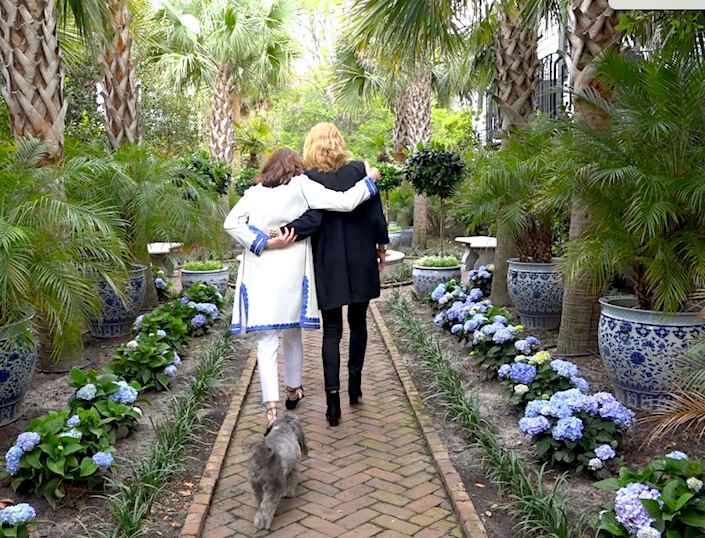 Entry Tags: At Home with, Carolyne Roehm, Charleston, house tour, interior design, Video Bookmark the permalink. I love it! Pottery Barn fake coral, Trader Joe’s flowers and world class antiques! A really lovely home. No one does it better… absolutely no one. So much valuable fun into all our days. This video is especially wonderful. Three very clever and lovely ladies. Grand and glorious to see. And,I especially love the way CR takes hold of your hand that has been wrapped around her waist. A very touching and genuinely loving gesture. What a delicious feast for the eyes! So much to love and to learn! Will be watching again and again. Thank you! Love her and her style! We just had the pleasure of hearing her speak at the bloggers conference in L.A. She was charming. Love these road trips! I could have watched an hour of this. Carolyne is so charming, and such a real person – there is no pretense with her, and yet she has such elevated taste. She did a spectacular job with Chisholm House. She is also a very talented artist. 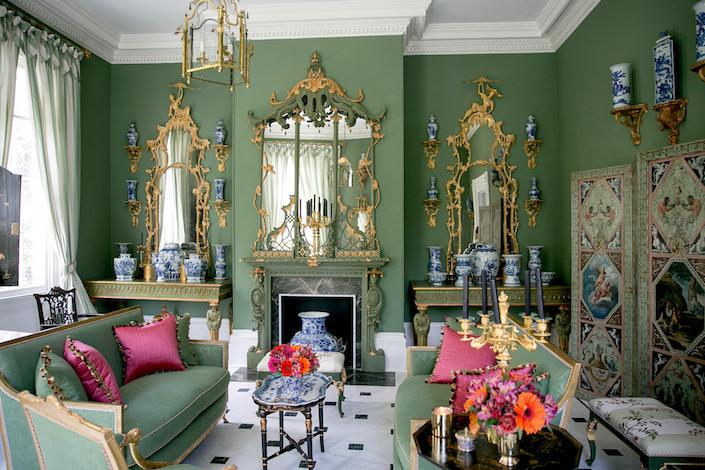 Carolyne Roehm is an absolute design goddess. I have admired her work for years. She is a legend and one of the most talented, knowledgeable designers out there. Everything she touches is exquisite. Am I alive?? No!!! I died and went to heaven…of course, heaven is now called Chisholm House! all: generous with your art and beautiful personality. amazing visits thru these videos…a big, warm “Thank You”! Binge watched all you shows this weekend even the ones I’ve seen before . Soooo good. I know that house well . She has done a wonderful job renovating and decorating it . Wow! What a delightful lady! Beautifully shot Stacy. What a treat! Thank you for such a great video. A very talented lady and gracious to let us look into her magical world. So lovely to see more of Carolyne’s decorating. I miss her blogs. Love your videos there are amazing! I fell in love with Carolyne Roehm ever since she answered the question, posed to designers by a magazine, as to what they would do with twenty dollars. Others mentioned room scent, soaps, etc but Ms Roehm declared that she would spend that twenty dollars on a mega-sized package of paper towels! Practical, down to earth–yet tremendously elegant, is CR. Great combination, to my way of thinking. And she can paint watercolours to rival those of the 17th century. Amazing woman. So many meaningfully woven details with a historical background! I love the bird’s room, pictures! And who would not enjoy being a guest in that tiny yet delicious pattern bedroom? ✌ This lady owns a plenty noble feelings which you can see in her gesture, movement, ease of being… Still she is down to earth as well. Loved this! Wish you could have done a series here at Carolyne’s. So much inspiration. Thank you! Needless to say this was an amazing video and tour! What a magical day for you all! Thank you for giving us s glimpse into the Iconic Carolyne Roehm’s home. Very inspirational as I’ve admired her for years and years! She is ICONIC for sure, such grace. These are the best interior designs, which every life lover wants to have in their home. Thanks for sharing this post. Seriously!!!! That upstairs!!!!!!!!!!!!!!!!!!!!!!!!!! omg, this is so gorgeous and my favorite video to date, only waited – was it six months or longer? for it!!! Worth every minute. LOVE!!!!!!!!! So fun! Of course we know she meant “consoles” when she said the green room started with the ”commodes.” But it’s the treat of the unscripted visit. I met you in NASHVILLE AT BREAKFAST! Tell me the BIG BOOKS on the dining room table; does she use those for PLACEMATS?!!!!! MY GOD I LOVE THAT IDEA! I have one of her books with a VERY SPECIAL inscription to me!!! I love EVERY THING about this WOMAN! Those rooms take your BREATH AWAY!!!!!! I feel I must GO BACK TO CHARLESTON and find HER HOUSE!I will walk until I DROP!!!!! 85 queries in 0.709 seconds.